Warning: This review contains minor spoilers and playing Florence might make you ugly cry. Florence Yeoh is your typical 25 year-old: she goes through her daily routine of work, scrolling through social media and eating dinner in front of the TV. One day, she hears beautiful cello music coming from a nearby park and that is where she sees him: Krish. You meet. You go on your first date. You go on many more dates. You kiss. You connect. He moves in and… as you get to really know each other, like only lovers can, you start to drift apart. For anyone who has fallen deeply both in and out of love, Florence’s slice of life narrative will hit close to home. What really got me is how the game translated these experiences into simple interactive elements, accompanied by a lovingly scored soundtrack and without the use of any dialogue. 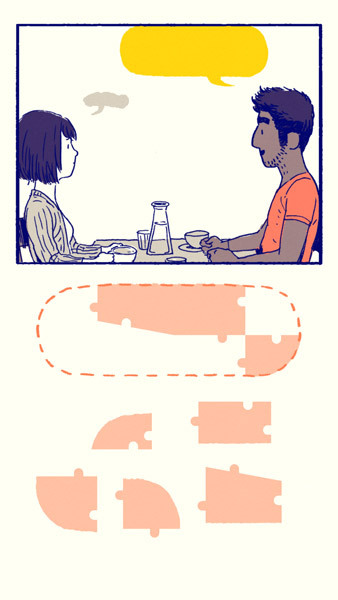 On your first dates with Krish, you need to assemble puzzle pieces to form a word bubble: choosing your words, finding the right topics of conversation. As the dates progress and friendship blossoms, conversation becomes natural and instinctive: 6 pieces become 4, 4 become 3, 3 become 2 and finally, 2 become 1. During your first fight, the pieces become more jagged as words become more hurtful. You try to assemble the bubbles as quickly as possible to get your words in before his and progressively feeling the mounting pressure of the argument. Florence is the embodiment of the adage “quality over quantity”. The game is short, it took me under an hour to finish my first playthrough but during that time, I was completely immersed. The world around me faded as the simple art and breathtaking music transported me into Florence’s world. I got annoyed at my mom trying to meddle into my life. I fell in love with Krish. I fell out of love with Krish. I felt lonely without him. I felt renewed when I decided to change my life for the better. I’m a blubbering mess and I love this game. Florence is available now on iOS and Android. Interesting. So is the whole game a puzzle aspect, or is each “stage” different? It’s more like an interactive story with simple mechanics. The puzzle are just for the speech bubbles because they represent how you choose your word and form your thoughts. There are other mechanics to represent other aspect of your daily life: brushing your teeth, sketching, balancing budgets at your day job etc. It’s not about presenting a challenge, it’s being immersed and involved in the story. Never heard of this game, but I’m immediately downloading it. OMG! I love it! I’m going to download it asap!